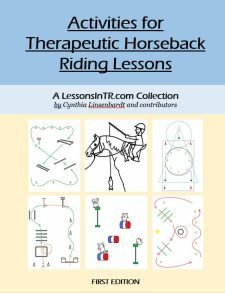 Now that you’ve got some resources for your lesson plan, here are some resources for teaching techniques on interacting with riders and dealing with specific behaviors. Again, most of this info is from Susan McDowell’s seminar “TOOLS from the AUTISM SPECTRUM DISORDERS SURVIVAL KIT,” and Claudine Pelletier-Milet’s book Riding on the Autism Spectrum. Because they have build a protective shell around them, you will need to pay close attention to nonverbal behavior. Every gesture, reaction, preference, registration of their surroundings, emotion, sound they hear, where they are looking, what they are feeling. This gives you clues to their inner world, and how you should react. Ex) If they are listening to the rain, they may not be able to listen to you, so join them and talk about how what they hear is the rain. Instead of forcing them to change, adapt and meet them where they are at. Then they will be more likely to progress with you. Let them tell you how they want to emerge and engage in the real world. Remember the “Sensory Funnel”(first concept on the Understanding Autism post)? We need to address sensory issues first because overloadis the root of emotional and behavioral problems. they often shy away from noise directly in front of them, until they let you in to their world. Communicate to one sense at a time. If the rider cannot process visual and auditory at the same time, they cannot look at your while you talk. So talk without demonstrating, or demonstrate with talking. Before repeating an instruction, and for each step of a request. Tell sidewalkers to wait ___ seconds before helping. Give only a few instructions at a time. Often people with ASD have problems remembering sequences. Either give a few steps at a time or write down all the steps on a piece of paper. Give verbal prompts to prepare them. – Ex) before halting tell them “We’re going to halt, so we say “whoa.” Can you say “whoa”? If they don’t respond, say “let’s say whoa.” If still no response, have the sidewalkers say “whoa” then use Hand Over Hand to halt. Use firm touch instead of light. Keep your hand open/flat/closed to avoid accidental pinching and grabbing. Use Hand Over Hand initially to start associating words with actions. Ex) to hold the reins, press their hand firmly on the reins and say “hold please,” if they hold them then give praise, if they drop them then try again. Use Hand Over Hand to start off the movement but let them finish it. Ex) to steer, start moving their hand the correct direction but let them finish the movement. Use Hand Over Hand on one hand only (on both hand can be distracting). Use Hand Over Hand if the individual has trouble with sequencing. Don’t force him to do something just to complete a task. Help him learn how through repetition and patience. Even if he doesn’t get it at first. It may take 15 minutes or several lessons! Ex) When teaching him to put the rings on the pole, first he grabs the rings and holds on. Instead of forcing him with hand over hand, show him how to do it by demonstrating yourself. If he throws it on the ground, again just show him how to do it by demonstrating yourself. As he does different things with the rings he is learning about the space around him. Eventually he will learn he can put the ring on the pole. Praise their riding. Claudine told a story about telling one rider sincerely “you are a good rider!” and it drastically changed the rider’s behavior and relationship to her. I did this with one of my riders when he was having a frustrating moment, and he gave me good long look and decided to keep trying. Praise helps put their guard down. They may not often hear they are good at something. When there is an unexpected change in routine, call the parent to let them know. Intentionally structure change into the routine. Consider slowly integrating change with the rider’s permission. Or have 1 thing new and different each week. Give them time to transition from one activity to another. Use diagrams or picture stories to introduce changes to routine. During lessons take turns riding each other’s horses – in the middle of a lesson, switch! Match the horse’s movement to the rider’s needs. If they’re wound up, use smooth movements and quiet riding. If they’re seeking input, use changes in rhythm and transitions within and between gaits. Can help calm riders down. Some people with ASD only think in pictures. For “up” and “down” demonstrate by throwing a ball or having picture cards. When using picture cards, have the whole word on the same page at the picture, to help associate the word with the picture. If they have fixations, use them to motivate! Let them watch the horse poop. If they are afraid of what comes out of the body, it may help reassure them. Let them watch the horse whinny. If they have trouble talking, it may help them figure out how to use their breath. Let them watch the horse eat, and help feed it. If they have trouble with food, it may help them branch out. 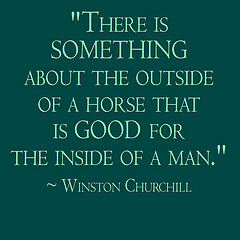 Use the horse’s body language to teach them about communication. Deep pressure may help curb it. Have them wear a tight vest. If they don’t like their hands touched, instead of Hand Over Hand, try touching the upper arm or manipulating the reins. Watch how many people are talking at once. More than one might be overstimulating! If so, assign only 1 person to talk at a time. Ex) When the instructor talks everyone listens. When steering, only the sidewalker on the turning side talks. They are often seeking vestibular (balance) and proprioceptive (muscle/joint) stimulation, so do activities that feed this need. Use Hand Over Hand if needed. Praise him even when it takes Hand over Hand. Look for small clues of interest, such as a quick glance away. Encourage them to use their own rhythms and voice. Also, I’ve had several readers ask to include information about working with adults and teens with autism, so since I haven’t had as much experience with that end of the age spectrum, I’d like to ask for your suggestions and ideas! Please leave a comment below or use the contact page to send me your experiences, and I’ll include them in the last post in this series on working with teens and adults with autism.